Since infrared radiation is very easily absorbed by water, and there is a lot of water in our atmosphere, it is quite hard for any infrared radiation from space to reach the surface of the earth. 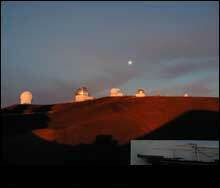 If astronomers observe in the infrared from the ground, it is necessary locate their observatories on the peak of a high mountain such as Mauna Kea in Hawaii. Canada, in partnership with the Netherlands and the United Kingdom, operates the Joint Astronomy Center on Mauna Kea, which has the largest ground-based infrared telescope. Windows into the universe from the earth's atomosphere: the moon rising over the Mauna Kea summit ridge as the sun sets.